This measure has exceeded its target. A PCR of 100 indicates that pavement is newly constructed. It is important to note that the average age of existing pavement within the City of Sugar Land is approaching 40 years old. The evaluation statistics show a majority of the pavements are in good condition due to City-performed maintenance, however, there are streets that require reconstruction. The City of Sugar Land takes the quality of streets seriously, and is evidenced through projects such as the reconstruction of Williams Trace Boulevard. Additionally, the City utilizes a third party firm that specializes in Street Evaluation and Pavement Management. This firm provides the City with a comprehensive road network score every three years, and in the intermediary years, the firm works together with Sugar Land staff to update the score annually. The most recent result score was from December 2017 (FY2018). A consultant periodically provides the City of Sugar Land with a comprehensive road network score every three years. This score is based on Pavement Condition Ratings determined from visual surveys performed by trained external field raters. In intermediary years between surveys, City of Sugar Land staff, in conjunction with the consultant, will update the score annually using the same methodology. All reconstruction projects and any new road systems will be taken into account. The most recent result score was from December 2017 (FY2018). 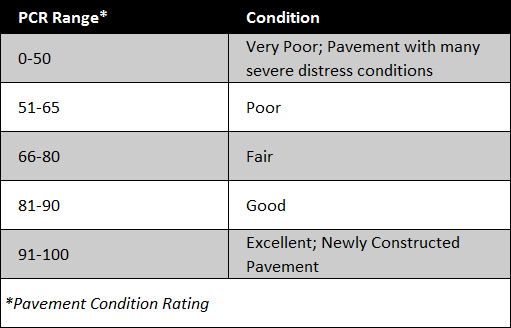 Pavement Condition Ratings are assigned on a 0 - 100 scale, with 100 representing a perfect rating and 0 representing an unusable pavement condition. The City Council has communicated their intention to pursue and fund a street maintenance program and long-term capital improvement plan aimed at maintaining at least a 65 pavement condition rating. Constant road deterioration due to traffic and environmental stresses results in the decline of road quality, which impacts public safety and quality of life. Accurate assessments of the City's streets improves the City's ability to estimate future repairs, plan maintenance, and estimate street funding needs. City of Sugar Land Public Works Department - HVJ Associates Report. HVJ Associates is a company that specializes in Street Evaluation and Pavement Management. HVJ Associates provides the City with a comprehensive road network score. In the intermediary years, HVJ Associates work together with Sugar Land staff to update the score annually.